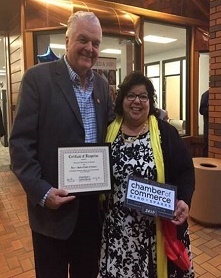 On October 12, 2018, at the ribbon-cutting ceremony for the Grand Opening of the new American Job Center Of Nevada, Stephen F. Sisolak was Commissioner of Clark County, Nevada. On January 7, 2019, he was sworn into office as the 30th Governor of Nevada! Board members of Nevadaworks—KRA’s funding-partner—other elected officials and area business professionals listened as Mr. Sisolak spoke about the critical role the Center plays in preparing jobseekers with the education and skills-training resources needed to compete for potential, hi-demand employment opportunities in the Region. This AJC is the first Comprehensive One-Stop Career Center in Northern Nevada under the 2014 WIOA. As the Center Operator, KRA ensures that a wide variety of co-located partner agencies and organizations provide the highest level of Career Services to area jobseeker-customers. The Center is already making a difference for local un- and under-employed persons, who are struggling with how and where to look for work. For example, JOIN (Job Opportunities In Nevada) Inc. —WIOA Title I Provider for Adult, Dislocated Worker, and Youth Programs Services—reports a 50% increase in foot traffic since relocating to the new Center! In addition, Business Services’ programs support employer-customers with free services, including posting career opportunities on appropriate job-recruitment sites, screening job candidates, providing private interviewing rooms, and assisting with planning and hosting both “open” and “targeted” Career Fairs. KRA is also the Operator of the Comprehensive One-Stop Career Center in Las Vegas, under the auspices of Workforce Connections, the WDB for Nevada’s Southern Region.